This recipe comes to us from one of my favorite blogs, Use Real Butter. Not only is she a fabulous cook but an amazing photographer too. (And she has a super sweet black Lab who often cameos, how could I not be smitten?) The first time I made this, like with most new recipes, I make it the way it is written. But hubby wasn’t too keen on it. I think it was the tahini flavor that got him. So the next few times I’ve made it with almond butter instead, which for us paired better with the maple, orange and sliced almonds. I also prefer a less oily dressing usually, so I reduced the oil. I’ve also made this for a GF Gals night and one of our local support group potlucks. It has gone over well at both occasions. Whisk together the orange juice, maple syrup, almond butter, and salt in a medium bowl until blended. Slowly add the olive oil while constantly whisking. In a large bowl, combine the salad ingredients. Pour the dressing over the salad and toss to coat. It’s best if the dressing is stirred in an hour or two before serving so that it has a chance to soften the raw kale leaves, especially if the recipients aren’t as big on raw kale as we are. 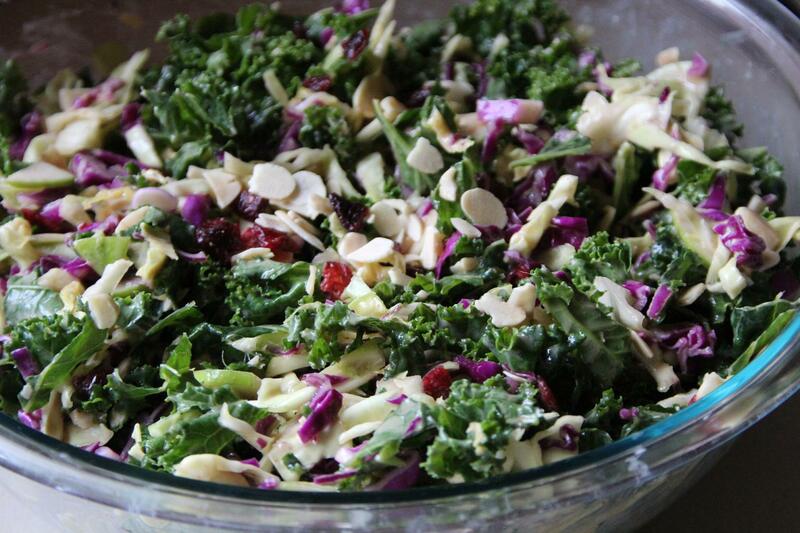 Or, if you love raw kale salads, you can make it and serve it right up.